Here’s a tempting deal for all the blue raspberry fans out there. 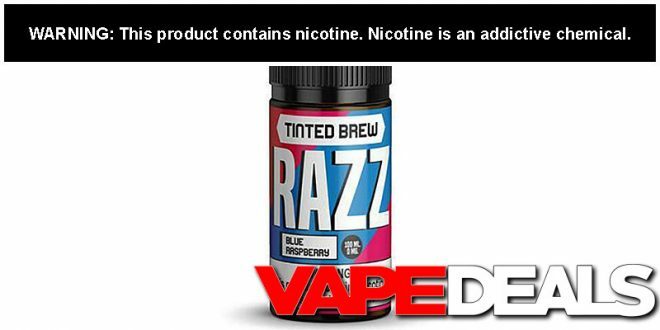 EjuiceConnect is now selling the 100mL bottles of Tinted Brew RAZZ and RAZZ ICE for only $7.99 each! That might be the lowest price I’ve ever seen for Tinted Brew E-liquid (if you ordered this directly from their site, it would cost $14 more!). There are 2 nicotine levels available for each flavor: 3mg and 6mg. If you’ve ever tried this stuff before, feel free to share your feedback with the VAPE DEALS community in the comments below. **It’s also worth mentioning that you can pick up the S.W.K. flavor for $9.45 over at Eightvape right now. Check out the Eightvape E-liquid Deals List I posted today for more info. Flavor Profile: A delectable vape flavor that is bursting with Blue Raspberry and Blueberry candy goodness. This vibrant candied berry flavor provides a berry-licious vaping experience that will dazzle your taste buds from the moment you inhale.